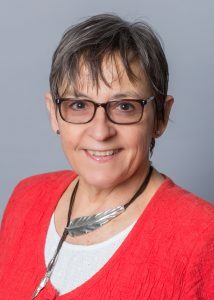 Dr. Maria Montserrat Gimeno, EdD., LCAT, MT-BC is an Associate Professor in the Music Therapy Program at the State University of New York at New Paltz. She was born in Barcelona, Spain, where she worked as a nurse for several years. She came to the states in 1993 to study Music Therapy. Since then she has earned a Bachelor’s degree in Music Therapy from Willamette University in Salem, OR, a Master of Arts in Music Therapy and a Doctorate in Counseling Psychology from the University of the Pacific in Stockton, CA. She has completed advanced clinical training at Florida State University for the Neonatal Intensive Care Unit, and Neurological Music Therapy at Colorado State University. Dr. Gimeno is trained in the Bonny Method of Guided Imagery and Music, and is a Fellow of the Association for Music and Imagery. She coordinated and taught the first GIM Training in Barcelona, Spain in 2016 and continues to teach the Bonny Method in Madrid, Spain. She has been invited nationally and internationally to teach the Bonny Method, including Austria, Argentina, Japan, India and Italy. Dr. Gimeno is known for her research on the use of Bonny Method and its Adaptations of Music and Imagery (MI) and Music and Imagery Relaxation (MIR) for use in medical settings. She is currently co-writing a proposal to conduct a research study on the use of MIR to decrease anxiety of breast cancer patients pre-surgery. She is writing a course handbook for “Communication Through Music with Spanish-Speaking Clients,” which can be used by music therapists who work with Spanish clients, and developing a project that will pair music and storytelling to reduce distress in children who are hospitalized. Invited as a guest speaker to present the study, “The Effects of Music Therapy and Guided Imagery on Pain and Psycho-Physiological Parameters in Patients Posted for Percutaneous Coronary Interventions” at the International Health Research Convention, Summer 2019, Sri Balaji Vidyapeeth, Pondicherry, Tamil Nadu, India. European Congress of Music Therapy in Denmark and host a recruitment table for SUNY New Paltz (June 2019). Selective Topic course Summer 2019 Session I. This two-credit course will be offered for degree students and for continuing education students (CMTE) for 30 credits: “Communication Through Music with Spanish-Speaking Clients.” I originally conceived this course for music therapists, however, I believe this course would benefit all therapists that are dealing with Spanish-speaking clients (May 2019). I am also preparing a proposal to offer this course as a program elective each summer. Bonny Method of Guided Imagery and Music (BMGIM). Adaptations of the Bonny Method in Clinical Settings (MED-GIM) in Barcelona and Zaragoza, Spain, and Plugia, Italy (July 2019). Continuation of Level III training in Madrid (Module I: Advanced Clinical) that was begun in Summer of 2018.